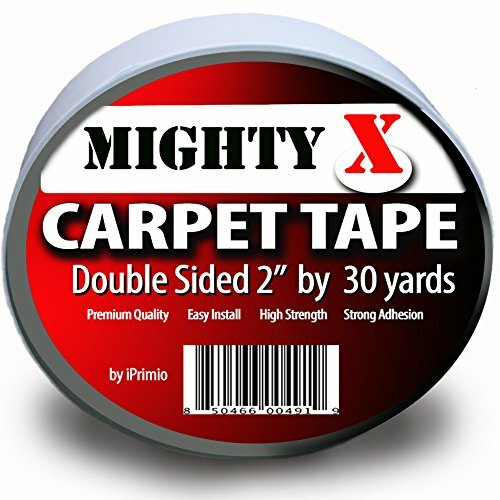 REGISTERED BRAND ON AMAZON: Mighty X Carpet Double Sided Tape (One Roll - 30 Yards / 2 Inches Wide) carpet tape. Easy to fasten and best of all, it WORKS! Peel outer side polyethylene liner to expose double sided tape. Cut and install desired length. Long term adhesion thanks to its high tensile strength and sheer stress resistance. Sticks to almost any floor and rug. Easily removed without leaving any trace of sticky adhesive that can damage hardwood floor finishes. Works great with NeverCurl that is sold on Amazon (keeps rug corners curling). Great combination! Adheres to the Rug and Floor - 2 Way Carpet Tape. Works great on Smooth or Rough Surfaces. Works Carpet over Carpet. All rugs. Works Great with NeverCurl (Keeps Rug Corners Flat) sold on Amazon.Strong Adhesion - Grips almost any rug and grips the floor. Super High Tensile Strength and Extra Thick. Allows it to Grip Even Rough Rugs.